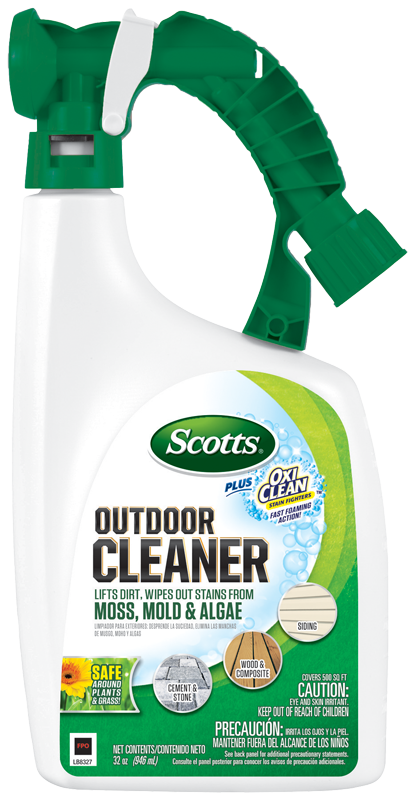 Scotts® Outdoor Cleaner plus OxiClean™ Ready-To-Spray bottle is great for cleaning large outdoor areas. Perfect for cement, stone, wood composite, brick, patio furniture, flower pots, siding, boat interiors and many more outdoor surfaces. The Fast Foaming Action of Scotts® Outdoor Cleaner Plus OxiClean™ lifts dirt and wipes out stains caused by moss, mold, mildew and algae. Plus, the bleach-free formula is safe to use around plants and grass. All you have to do is apply, scrub and rinse! When getting your outdoors ready for your next get-together, be sure to turn to Scotts® Outdoor Cleaner plus OxiClean™! Connect sprayer to garden or lawn hose. Turn on water. Bend small plastic tab back and rotate switch to ON position. Spray cleaner onto surface. Let set for 5 to 10 minutes. Time will vary depending on the surface and amount of dirt and stains. If surface appears to be drying, re-wet as needed prior to scrubbing. To stop spraying, turn switch to OFF position. Turn switch to ON/WATER position. Rinse surface with water after scrubbing. When done turn switch to OFF position and disconnect from hose. Residual foaming will naturally dissolve. OxiClean is a trademark of Church & Dwight Co., Inc. and is used under license by The Scotts Company LLC. ©2018 The Scotts Company LLC World rights reserved. Connect sprayer to garden or lawn hose. To begin spraying, point nozzle in the direction you want to spray. Bend small tab on side of sprayer and turn knob clockwise to ON position. Spray evenly over surface area to be cleaned. Container covers 500 sq. ft. of surface area. To stop spraying, bend small tab on side of sprayer and turn knob counterclockwise to OFF position. Turn off water and disconnect from hose. Let solution set for a few minutes. For best results, scrub as needed. Lightly rinse with water. If product dries, reactivate cleaner by scrubbing or lightly spraying with water. Foaming may continue after rinsing. Residual foaming will naturally dissolve. Great for large jobs, covers 500 sq. ft.
Scotts No‐Quibble Guarantee®: If for any reason you, the consumer, are not satisfied after using this product, you are entitled to get your money back. Simply send us evidence of purchase and we will mail you a refund check promptly. KEEP OUT OF REACH OF CHILDREN. CAUTION: EYE AND SKIN IRRITANT. Avoid contact with eyes and skin. If contact occurs, flush with plenty of water for 15-20 minutes. If irritation occurs, have the product label with you and contact a doctor or poison control center. You may also contact 1-800-543-8873 for emergency medical treatment information. Each wipe has a scrubbing side to lift tough dirt and stains, and a soft side to wipe away grime to finish the job. Works great on many outdoor surfaces. Springtime means patio time! Discover how easy it is to clean your patio so it is in great shape for entertaining and family time.